American Episcopalian Rector Phillips Brooks wrote the words to this well known Christmas carol in 1868 following a pilgrimmage to the Holy Land. He was apparently inspired by the night view of Bethlehem from the surrounding Palestinian hillside (then with an approximate population of somewhere between 300 and 1000). As Christians sing this carol year after year as part of our Christmas celebrations, we imagine a tranquil, peaceful scene, complete with a manger, a cow, a few sheep, some shepherds, and the Holy family. We picture a clear quiet night, with stars overhead. Sadly, if we cling to this image as an accurate portrayal of modern day Bethlehem, we are allowing ourselves to be severely misled. Bethlehem today is a city of approximately 28,000 people, 1/3 of whom are Palestinian Christians. It is home to the largest concentration of Christians in Palestine, a demographic group who now consist of less than 2% of the population of the entire West Bank. Christian numbers in the Holy Land are shrinking quickly. The oppression of the Israeli occupation is forcing them out. The surrounding hillsides which so inspired Brooks, are now home to over 100,000 Israeli settlers, living in 19 settlements and outposts. As they grow, they spread down the hillsides, taking more and more land from the local Palestinians. Bethlehem is also home to 3 refugee camps that house 20,000 refugees and their descendants – people who lost their land, homes and belongings as a result of the formation of the State of Israel in 1948 and came to the camps as refugees. Conditions in the camps are grim. 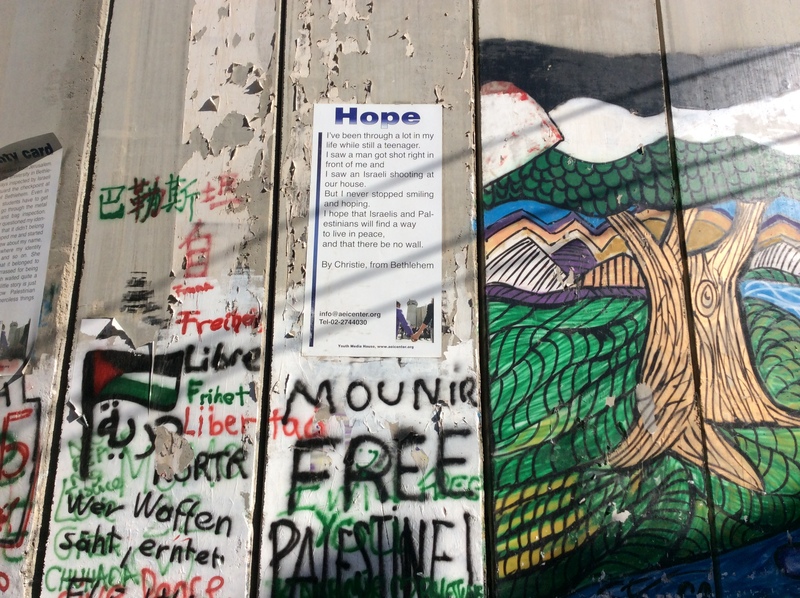 One of the camps, Aida Refugee Camp, is located on the north side of Bethlehem, adjacent to the 25 foot high Separation Barrier concrete wall that encircles Bethelehem on 3 sides and separates Bethlehem from Jerusalem. It is a well known place of violence, as the Israeli forces make frequent incursions into the Camp. Soldiers are known to use live ammunition, rubber bullets, tear gas, sound bombs, and skunk water against the camp’s residents, and Palestinian youth throw stones at the soldiers. “People of Aida refugee camp, we are the occupation forces. You throw stones, and we will hit you with gas until you all die. The children, the youth, the old people – you will all die. We won’t leave any of you alive,” the unidentified officer is quoted as saying. According to the Al Jazeera report, the video continued with more words in a similar vein. Unfortunately, the violence in the Bethlehem area is not restricted only to the Aida Camp. It happens in many places in the city and surrounding area. Israeli newspaper Haaretz (www.haaretz.com) reported that the following day, an 8 month old baby died in his home in the village of Beit Fajjar, south of Bethlehem. Reports could not confirm whether the tear gas drifted into the home, or if it was shot directly into the home. Since then, there have been multiple other reports of violence throughout the Bethlehem area. As I walked down the streets of Bethlehem earlier this month, I ran into a friend. As we talked, I asked him how things were. “Very very terrible” was his response. 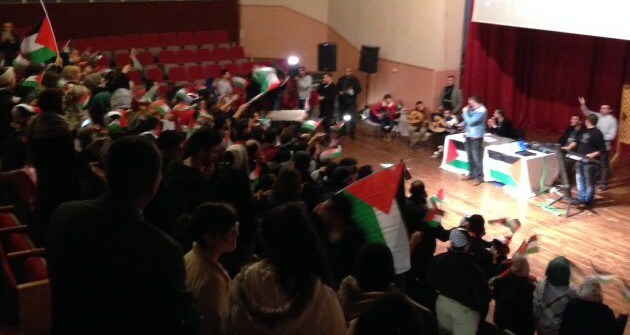 He spoke about the increased violence and the situation at Aida Camp. He spoke about how the tear gas drifts over much of the city, affecting residents far from the scene of the violence. As we talked, the offensive smell of skunk water (which smells nothing like a skunk, but instead carries an overwhelmingly foul sewage odour) lingered in the air, apparently sprayed by the army on the streets, homes and businesses of Bethlehem that are located in close proximity to the camp. Christians from around the world make pilgrimmages to Bethlehem, seeking to see and experience the birthplace of Jesus. This, in concert with the oppression of the economy as a result of the illegal Israeli occupation, means tourism is a major portion of Bethlehem’s economy. The fall months are often popular with tourists, as the heat of the summer is past. Last year, tourism dropped dramatically due to the Gaza war. This year, the increased violence throughout the Bethlehem area, Jerusalem, and the entire West Bank, is negatively affecting tourism. These days, my friend reported that the big tour buses come in from Jerusalem, go to the Church of the Nativity and the Shepherd’s Fields, perhaps stop at one or two of the major tourist shops, and then immediately head out of town. Smaller tourist shops, restaurants and hotels are all suffering as a result. It is a severe blow to the economy of the entire area. My friend went on to tell me about the effects of the occupation and the violence associated with it, on both himself and his family. I asked if I could take his picture and tell his personal story of life under occupation. He declined, fearful of reprisals and arrest from the Israeli forces. This is the reality of life in Bethlehem today. 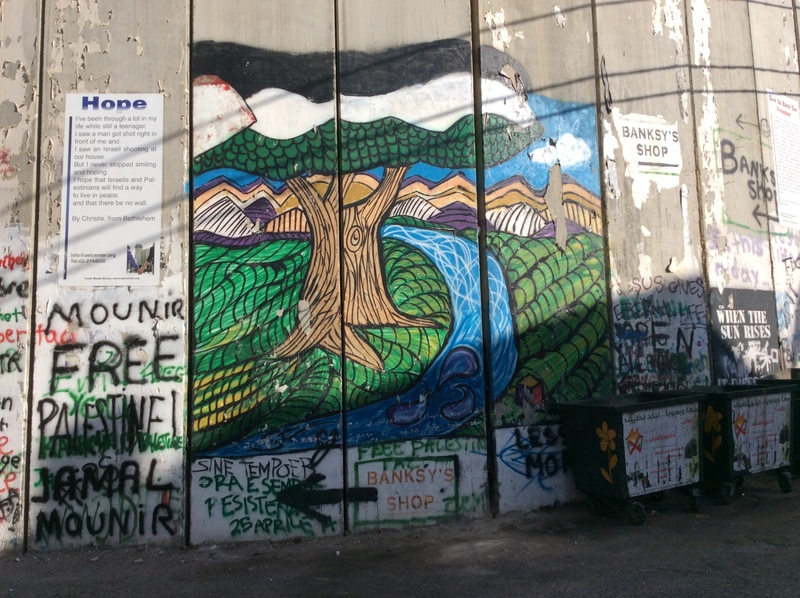 A mural, painted on the 25 ft high concrete barrier that surrounds Bethlehem on 3 sides. The mural is of a beautiful olive tree, with a Palestinian flag as the green leaf part of the tree, the fertile fields that surround the city, access to water, and the hills and desert in the distance. Even in the most dire of circumstances, it is important to find hope. Hope for a better day. Hope for an end to the violence. Hope for an end to the brutal occupation. Hope for peace. The Christian season of Advent is fast approaching. This year, I invite you to open your hearts to the people of today’s Bethlehem, through the use of an advent resource entitled the Kairos Palestine Christmas Alert 2015. Found at http://www.kairospalestine.ps, it contains reflections written by Bethlehem Christians for each of the 4 Sundays of Advent. 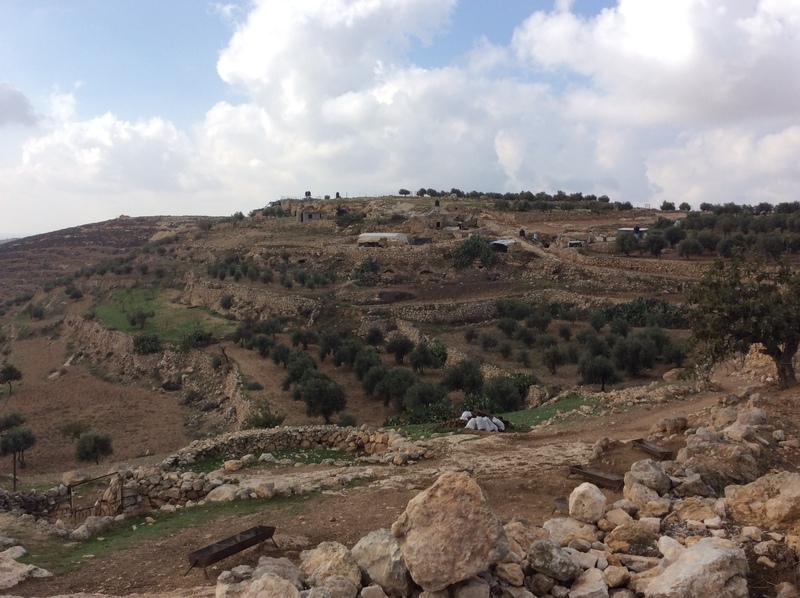 Birin is a small agricultural community located south of Hebron. Residents there raise sheep and goats, wheat and barley (primarily as food for the livestock), and maintain several olive groves. Spread out along the edge of a hill, the village offers a spectacular view of the beautiful Palestinian countryside. The view from just behind the Birin school. The rainy season here usually runs from Nov – Feb, but this year a few rains have come early, greening up the fields. Notice the sheep pen in the foreground, olive groves and small fields further behind. Another view from Birin. The white bags in the foreground are bags of olives, recently picked from the olive grove. The lifestyle here is simple and solid. Warm hospitality abounds. As you stand in the village, it feels quiet, far removed from the hustle and bustle of city life in nearby Hebron, only 7km away. The beautiful stone fences and basic homes can lead you to feel as if you have somehow stepped back in time. 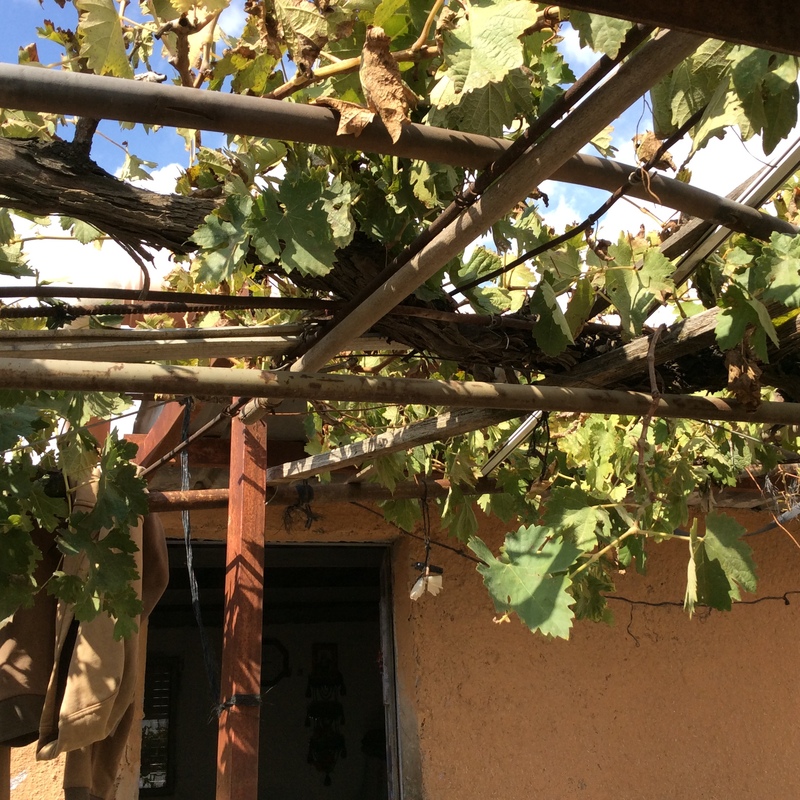 Beautiful grape vines in the front yard of one of the village homes. 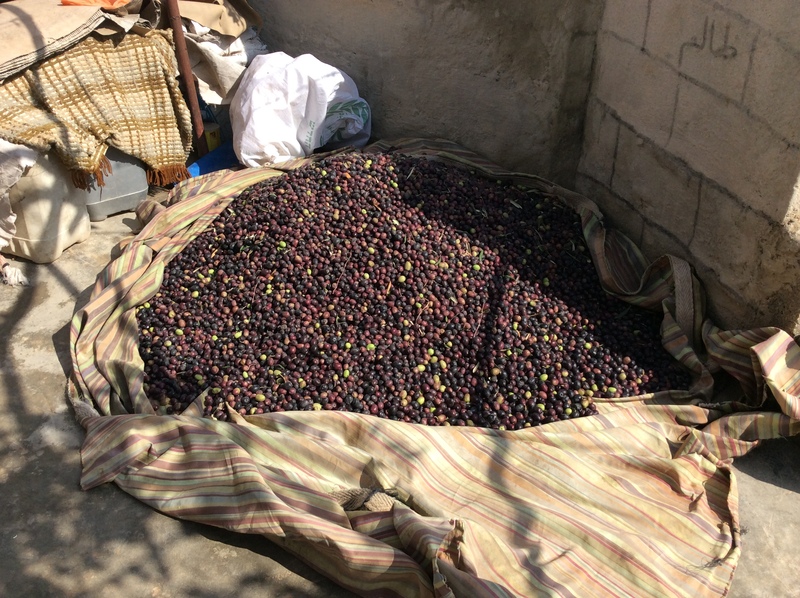 Part of the fruit of this year’s olive harvest, currently underway. There’s the odd tractor around, and the occasional “high mileage” car, but it’s probably more common to see donkey or horse drawn carts taking farmers back and forth to their fields. One of the donkey carts used as common transportation in the village and area. Up until 2 years ago, there was no school or other services in the community. Students walked the 6-8 km to school in neighbouring communities. Enroute, they encountered harassment from nearby settlers, requiring regular accompaniment by the local EAPPI team located in nearby Yatta. 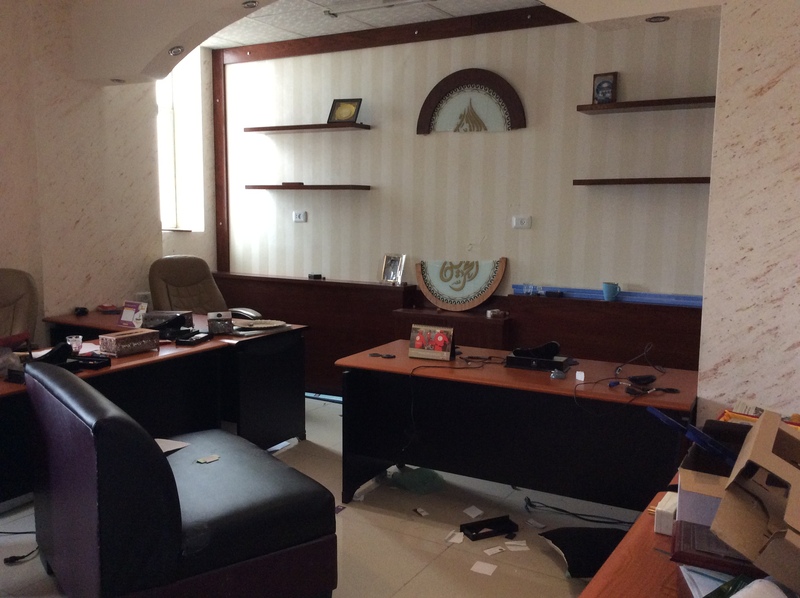 Unfortunately, the EAPPI team could not be there every day, twice a day. The school drop out rate for all ages was high. After a period of negotiations through HIRN, a long term rental agreement was arrived at with local property owners to provide a house to be renovated into an elementary school. 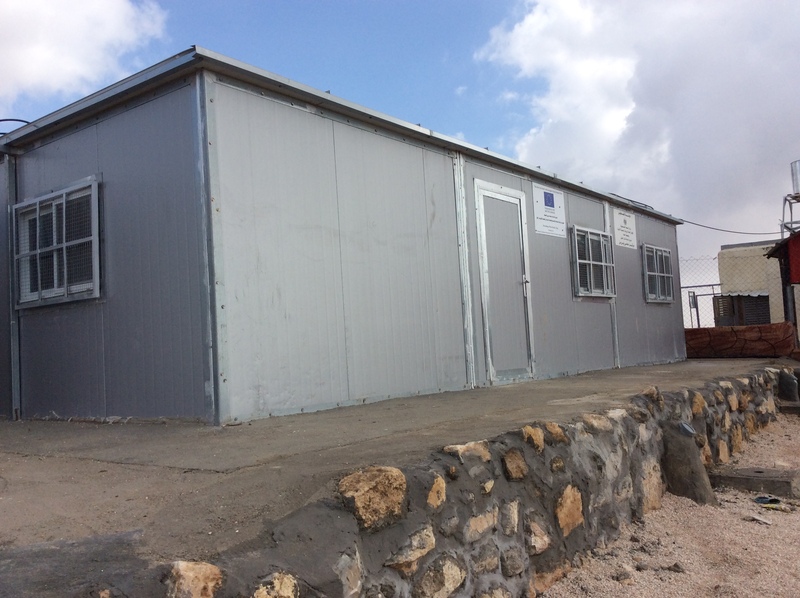 In the interim, HIRN was able to provide a temporary tent to be used for a school – a solution that kept the students safetly at home in the community, but exposed them to the elements and made learning conditions difficult. HIRN then lobbied international NGO’s for funding to cover the building renovation costs. The new school was opened in October 2014, with great excitement. It was a true celebration – complete with the requisite speeches that seem to come with all such occasions wherever you are, Arabic coffee, sweets, and a goat meat and rice dinner that followed the ceremony. We stopped in to visit the good people of Birin last Sunday afternoon, and were excited to see the changes in the village over the last year. 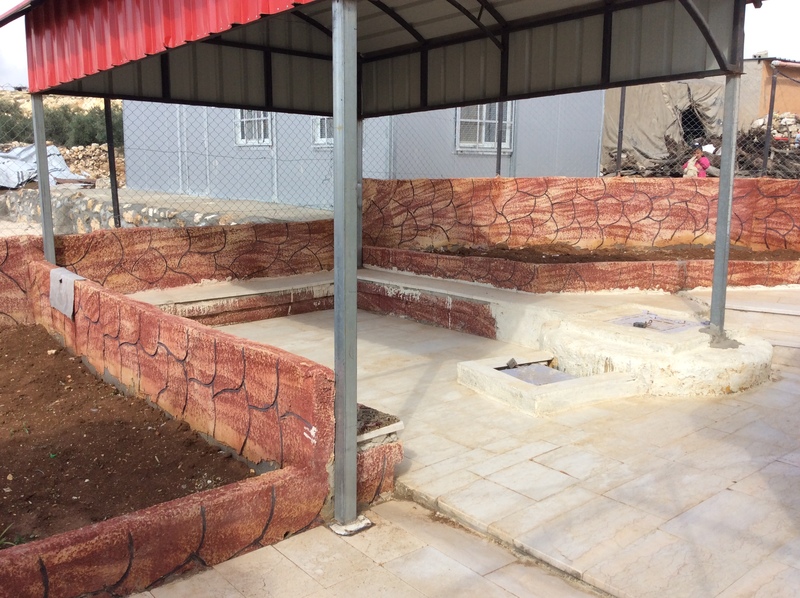 There has been a 2 room addition added onto the school, bathrooms have been installed, and there is now a covered play area for the children to shield them from the hot sun. The school (2014) with the new 2 room addition. The rooftop provides space for solar panels to supply electricity, and water tanks to provide water. 27 Grades 1-7 students are enrolled in the school. The school’s new bathroom units. The brightly coloured covered children’s play area, protecting students from the hot sun. There are new solar panels in the village, providing electricity for the school and individual homes. There is clean water for the school, with plans to provide it to the remainder of the village. And there is a new medical clinic, staffed by an itinerant physician. 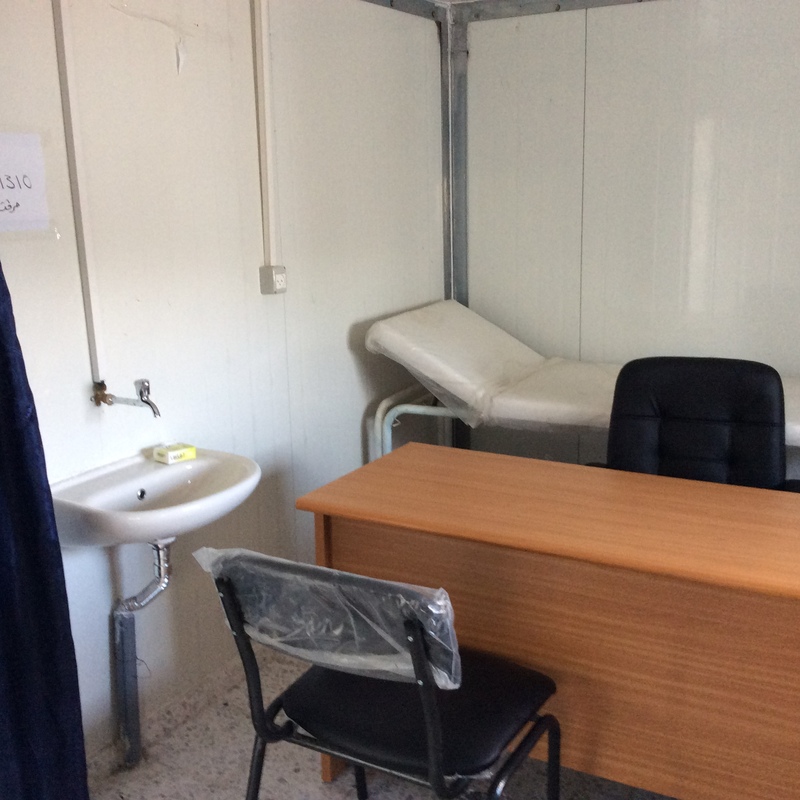 The examining room in the new medical clinic. Note the electrical outlets and sink with running water – all unavailable in the community 1 year ago. As we were leaving Birin, village elder Khames was deep in conversation with HIRN’s Hamed Qawasmeh. 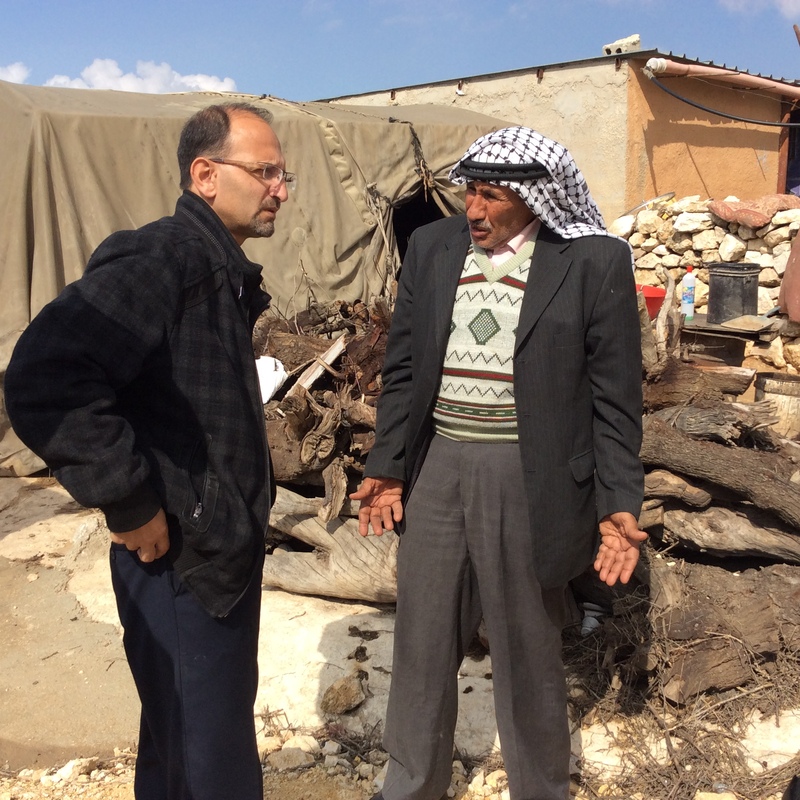 Village leader Khames, discussing future plans with HIRN’s Hamed Qawasmeh. It seems that more change is in the air. Pleased with the progress to date, villagers are excited about further improvements planned for Birin. Soldiers. Old City of Hebron. H2. In what can only be interpreted as a form of collective punishment, the Israeli authorities have instituted a series of road closures out of the city of Hebron. For the last several days, 4 of the 6 exits out of the city have been closed. Given that the 2 open exits change on a frequent basis, drivers are left guessing as to which ones are open, creating a whole lot of frustration and inconvenience for all travellers – small minibus service taxis, private cars, and industrial traffic. Reporting of such inconveniences has previously been done by the radio station that was raided last week, leaving no reliable source of such information. 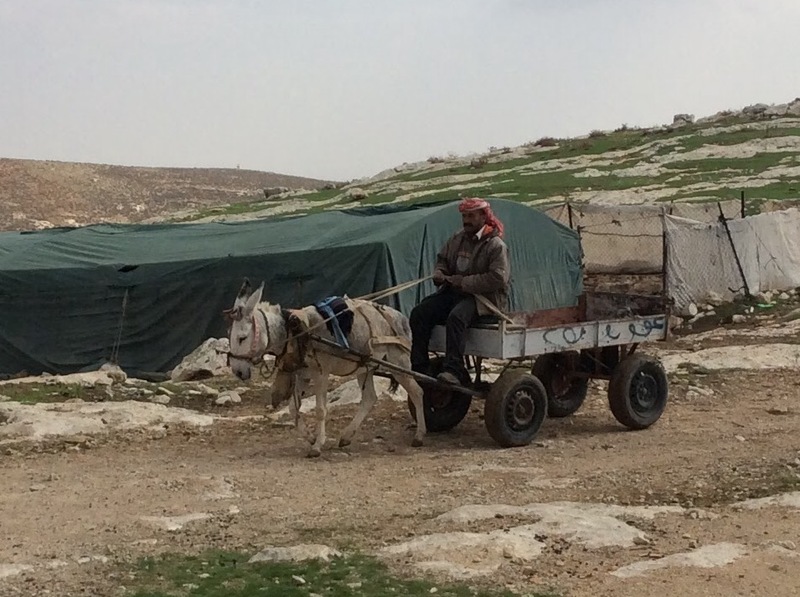 This past Thursday, we were attempting to go to Susiya in the South Hebron Hills. We took the usual way out of town, only to find ourselves in a traffic jam and learn that the road was closed by a gate. We drove around to the second nearest road, only to find the same story there. Finally, we tried the third road and were relieved to find it open. All of this meant a delay of well over an hour. 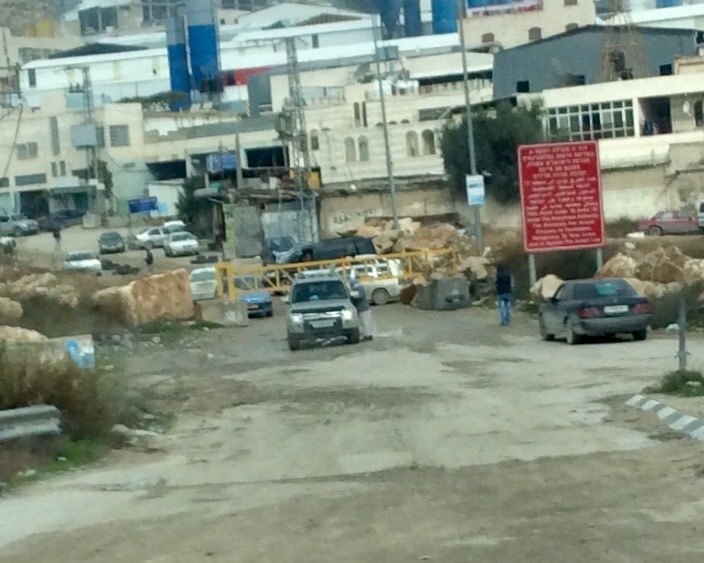 A locked gate, blocking traffic in both directions on one of the main roads south from Hebron. On Friday, I was expecting a friend to visit from Bethlehem, located about 20 miles north of Hebron. Given the road closures, it was uncertain as to whether or not the service taxis would be running, and whether or not she would be able to come. Unsure of what to tell her, we took a drive around town. The primary entrance from the north was closed with dirt mounds, the first time this has happened since 2007 (when it remained closed for a year). Fortunately, another entrance was open and she was able to come. 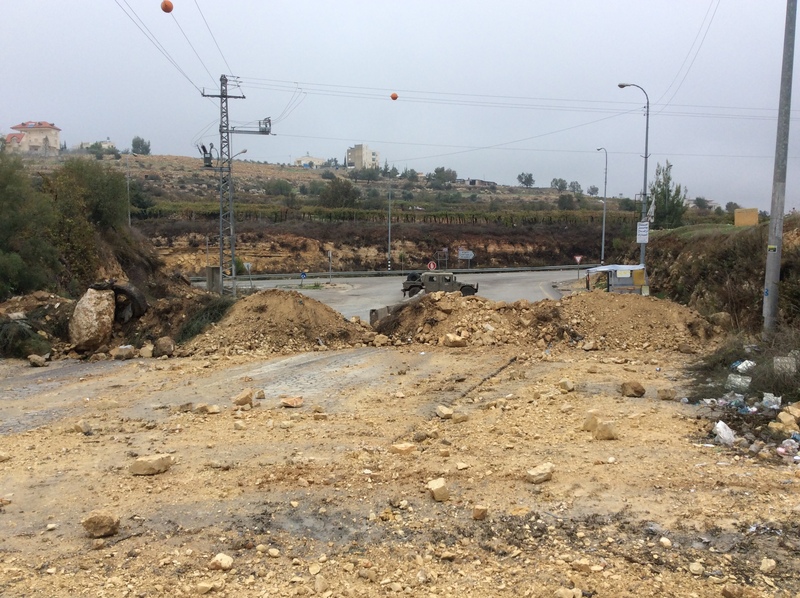 The main road out of Hebron to the north, blocked by earth mounds. On Saturday, it was more of the same. The Bethlehem friend needed to get to Jerusalem, and a friend from Jerusalem was coming to Hebron. Again, more uncertainty as to how all this would happen. Extra phone calls, extra planning, extra concern. In the end, both got to their destinations. Our travels on Sunday and today were also marred by road closures in and out of Hebron. The one road that was open to the south on Sunday was closed today, with the army installing concrete barriers. It was previously closed from 2000-2010 with similar concrete barriers. One road to the north now has concrete barriers across it as well. As we returned to Hebron today, the one open road to the south was interrupted by a flying checkpoint – essentially soldiers stopping vehicles traveling in and out of the city, creating more disruption and harassment. 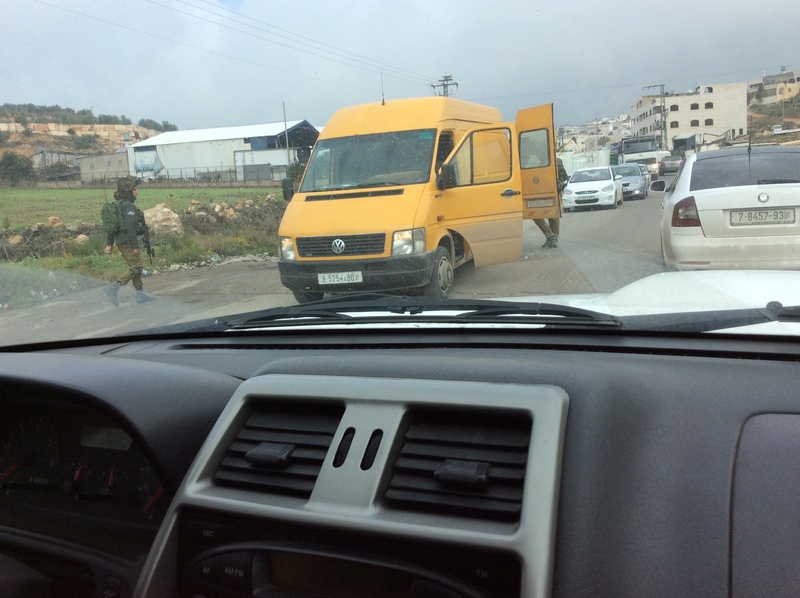 This yellow truck was being checked by soldiers at a flying checkpoint on the open southern road in and out of Hebron . The driver stood at the rear of the vehicle while soldiers searched through the contents of his truck. No doubt his identification was checked as well. 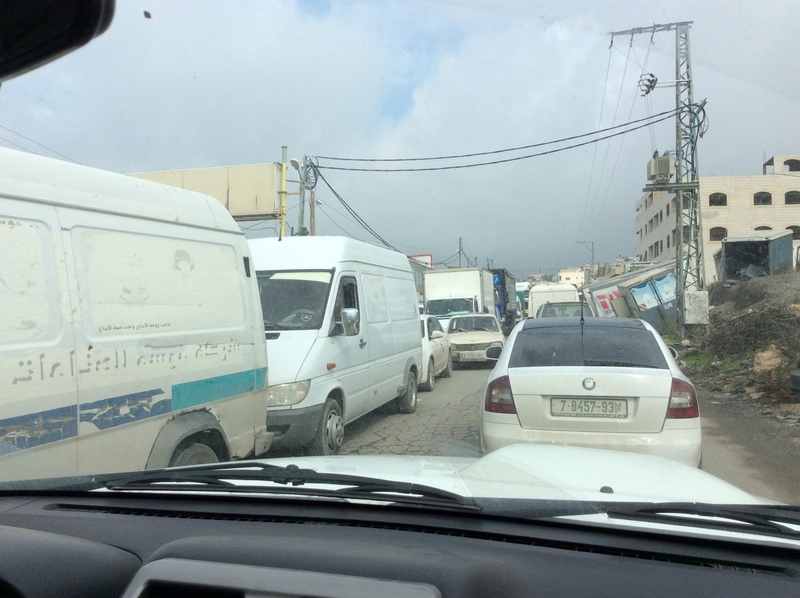 This was what it was like for the rest of us, as traffic was backed up in both directions at the flying checkpoint into and out of Hebron today. Amidst the chaos, the violence, and the pain that is in Hebron these days, we also have had some fun. Last week HIRN hosted the Easton Cowboys and Leeds Republica Football team from Bristol and Leeds, England. Following up on previous Cowboys tours and last year’s successful Cowgirls tour, the 18 men arrived for a week of football (soccer) with teams in the Hebron and surrounding area. With the Cowboy motto of “Freedom Through Football” as a guide, the team played games against a variety of opponents – a hard fought 4 on 4 game played on tarmac at Hebron University, games played on stony fields in the rural villages of Susiya and Um al Kher, at a refugee camp in Bethlehem, and concluded their tour on the final night playing 11 aside against a local community team on a rudimentary field, deep in the valley at A Taffuh. Along the way, the Cowboys won some games, they lost some games, but it wasn’t about winning and losing. 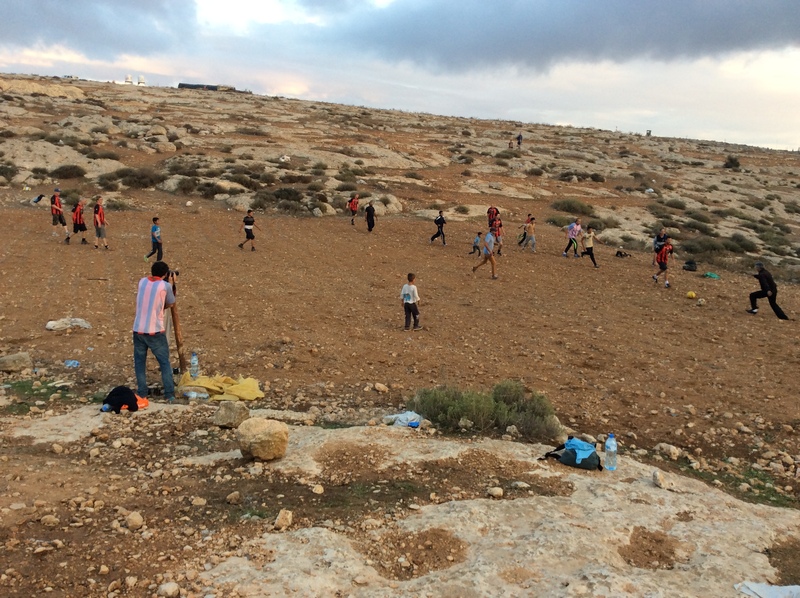 The Cowboys game in Susiya had everyone laughing and the spectators cheering good naturedly for both sides. 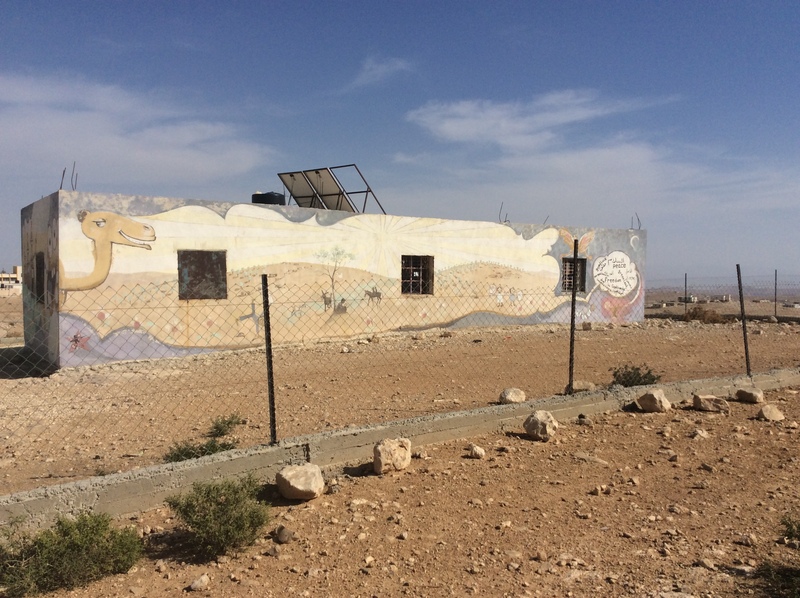 The majority of the Susiya team were young boys, so some of the Cowboys “evened things up” by turning their jerseys around and playing for Susiya. 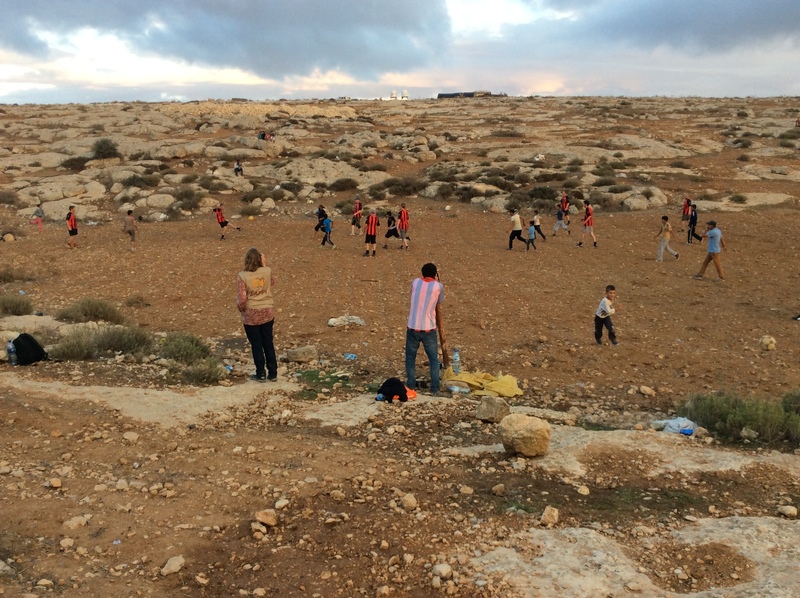 At one of the villages, in the midst of the game, the ball went over the fence to the nearby settlement – a settlement with a history of animosity, harassment and violence towards the villagers, a settlement that is home to residents who stood by the fence and cheered last fall as homes in the village were demolished by Israeli authorities. Everyone wondered what would happen next. In a moment of sheer grace, nearby settler children retrieved the ball, happily threw it back, and then were drawn in by the fun of the moment and stood watching the game – until their parents arrived and quickly took them away. It was a moment that gave pause for thought. 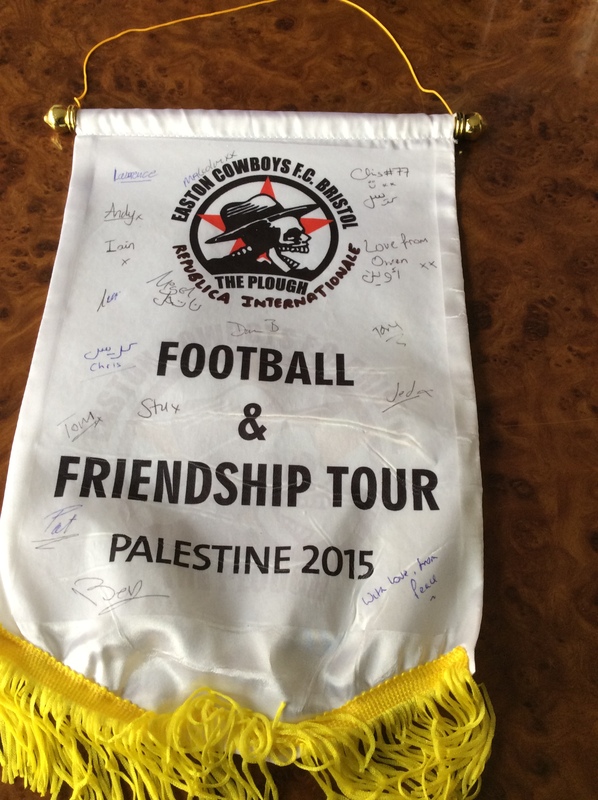 Using football as the medium to meet local people, the Cowboys learned about people’s lives here, about individual people trying to live as normal a life as possible amidst the restrictions, fear and violence that comes from the Occupation. They experienced the horror of the violence. They listened, and they cared. Through their presence, they brought a moment of distraction to those troubled by recent events, a smile and laughter to worried faces, a momentary reprieve from the burdens of Occupation. As they shared the simple joy of kicking a football around with local boys, and a common passion for the game that transcends language, cultural and political barriers, they forged friendships that will long be remembered. 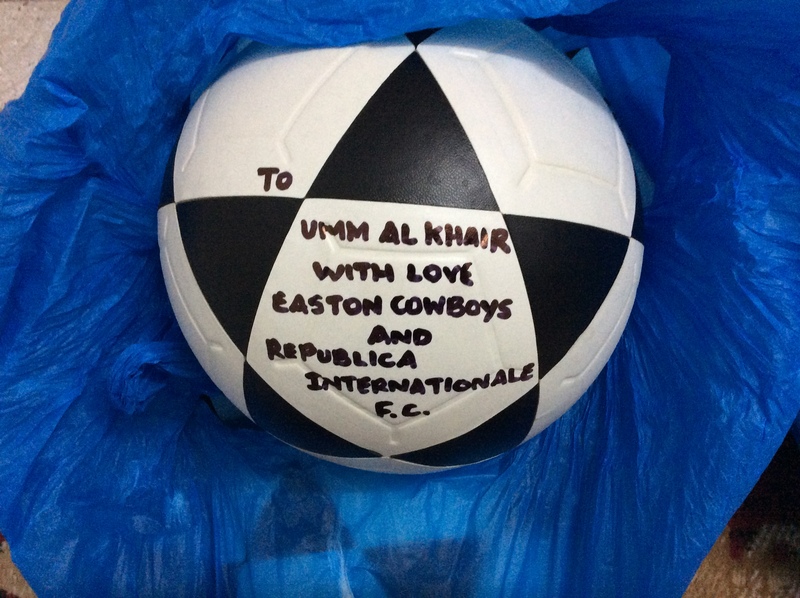 One of the many footballs the Cowboys donated to local communities and teams. Casualties in the Occupied Palestinian Territory (OPT) and Israel 1-31 October 2015 report found at http://www.ochaopt.org. Much of the violence over the last few weeks has been in the Hebron area, with the majority of it focused in the fully Israeli controlled H2 (Old City). The middle of the month onward has been particularly violent. 5 Palestinians were killed by Israeli gunfire in one day (Oct 17) in a series of unrelated incidents, there was 1 death on Oct 21 (tear gas inhalation), and 6 more Palestinians were shot to death in unrelated incidents between Oct 25 -29. The tear gas victim was 54 years old, while the gunshot victims were all young (15-23 years old). Two were female, the remainder were male. One of the gunshot deaths was at the hands of an Israeli settler (many settlers are heavily armed) and the remainder were killed by Israeli soldiers. During these incidents, 2 Israeli’s sustained minor injuries. All of the injured Palestinians were denied medical assistance by the Israeli soldiers and were left to die where they had fallen. Circumstances surrounding these deaths are disputed. The Israeli’s claim that all victims were attempting to stab an Israeli, while Palestinians argue that many of the victims were unarmed and allege that soldiers have planted knives beside the bodies of the deceased. 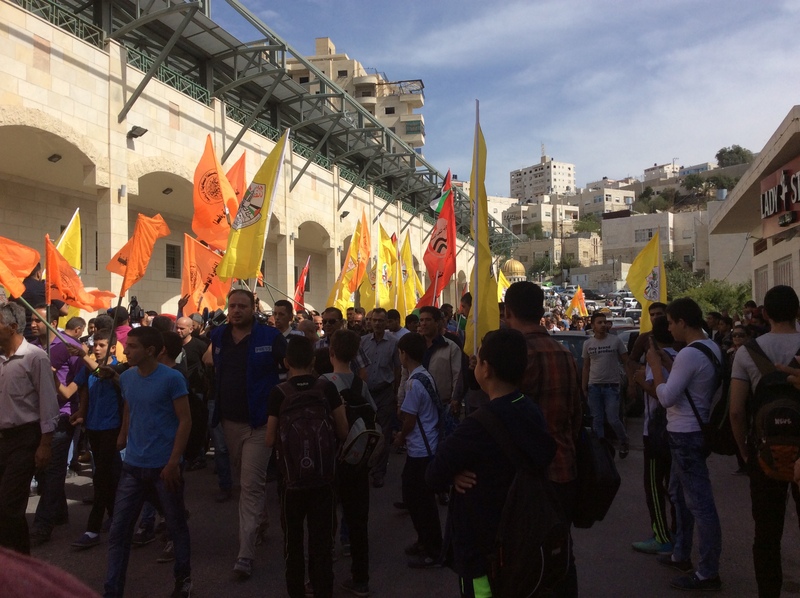 Amnesty International addressed the apparent disproportionate use of violence by the Israeli’s in an Oct 27 report entitled “Israeli forces in Occupied Palestinian Territories must end pattern of unlawful killings” found on the Amnesty website http://www.amnesty.org. In response to this violence, the Israeli’s have “increased security” in the area by increasing the number of checkpoints in H2 and by limiting access of young Palestinian males aged 15-25 through certain checkpoints. They have also declared the Al Shuhada Street and the Tel Rumeida neighbourhood of H2 a closed military zone, preventing non Palestinian residents from entering the area. These actions have many ramifications. International volunteers can no longer enter to accompany school children to school, something they have done for many years to protect the children from violent settlers. There is now genuine concern for the safety of these students. In addition, the community is grieving the loss of many loved ones, and levels of fear and tension are understandably high. A young Palestinian man living in H2 told me this week that people in the area are afraid to leave their homes even to get food, and many are terrified to go through the checkpoints. Of course, the violence does not stop with the killings. At a meeting on Wednesday of educational stakeholders, we heard that over 700 students in the area have recently been exposed to tear gas, and over 50 students have been arrested on their way to school. Many students and teachers have endured long delays at the checkpoints, and many are experiencing fear at passing through the checkpoints. In addition, there were allegations of male soldiers performing inappropriate searches on female students, leading a number of parents to keep their children at home. There were also reports of skunk water being used on Palestinian neighbourhoods, and concerns raised about the violence of one notorious settler who appears to act with complete impunity, physically attacking both Palestinians and internationals. This week, we attended a meeting at the Mohammed Ali Mohtaseb Hospital, the only hospital in the H2 area. As such, they receive the vast majority of emergency cases from the H2 area. 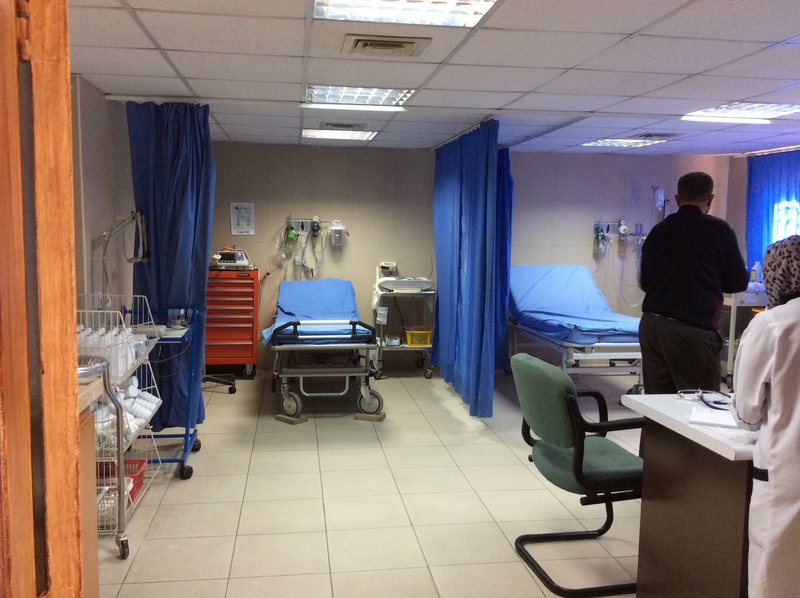 Other Hebron hospitals are located in H1, requiring a trip through at least one checkpoint and possibly multiple checkpoints. When time is of the essence, one cannot risk a lengthy delay while soldiers decide whether or not to allow the victim through each checkpoint. The H2 hospital officials reported a huge recent spike in tear gas inhalation admissions. One day last week, they received 70 students over the course of 1 hour from a girls school, all suffering from tear gas inhalation. Supplies are running low and with inadequate funding, they are seeking funds to replenish supplies. HIRN promised to work towards helping them access emergency response funding. We are also working to supply gas masks to the most severely affected areas. 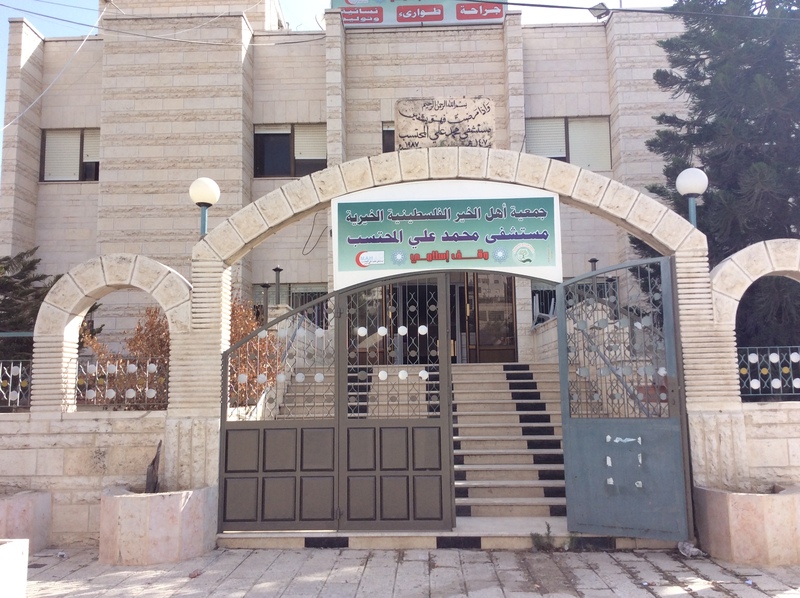 The Mohammed Ali Mohtaseb Hospital, the only hospital in H2 (the Old City of Hebron). The hospital’s 2 bed emergency room, stretched beyond capacity in recent days with emergency admissions of primarily tear gas inhalation victims, many of whom are young children. The United Nations Declaration of Human Rights was adopted by the UN General Assembly December 10, 1948. It came about in the aftermath of World War 2, and was the result of nations states coming together with the common purpose of affirming human rights for the entire human family, while seeking to avoid the atrocities of war. The drafting committee included Canadian John Humphrey, and was chaired by Eleanor Roosevelt. The document has been ratified by every country in the world and translated into 337 languages. It has been foundational for other declarations and treaties that have been agreed since then. As such, it is one of the most important documents of the 20th century. The Declaration includes 30 articles, covering a wide range of human rights. 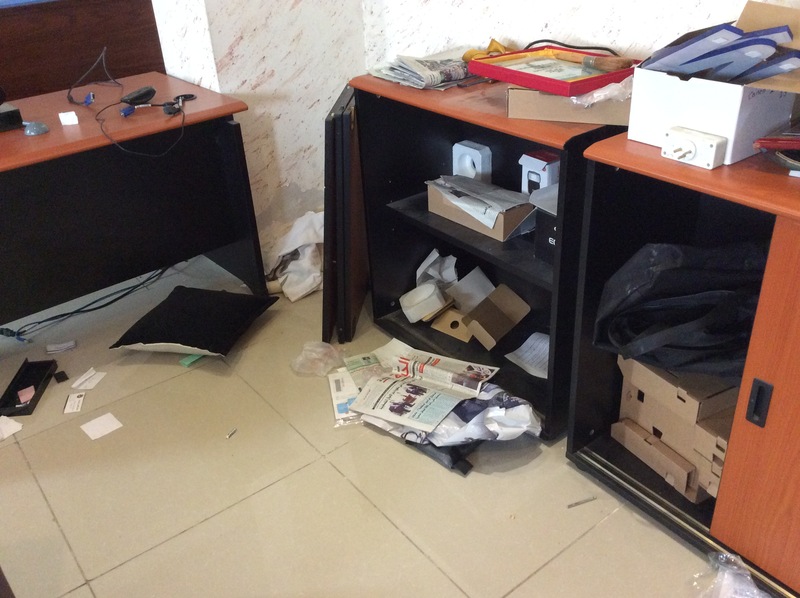 Respect for the freedom of the press and the rights of the residents of Hebron to “seek, receive and impart information and ideas through any media” was severely compromised early Tuesday morning, when the Israeli forces entered H1, the fully controlled Palestinian portion of the city of Hebron, at 2:30am ,to raid the offices of radio station FM 92.7, HR.PS. Carrying a military order that read, in part (and translated from Hebrew) “the military commander orders to close the station because it is necessary for public order, for correct governance and for the security of the IDF forces.” According to the order, the station is to cease operation for a period of 6 months. 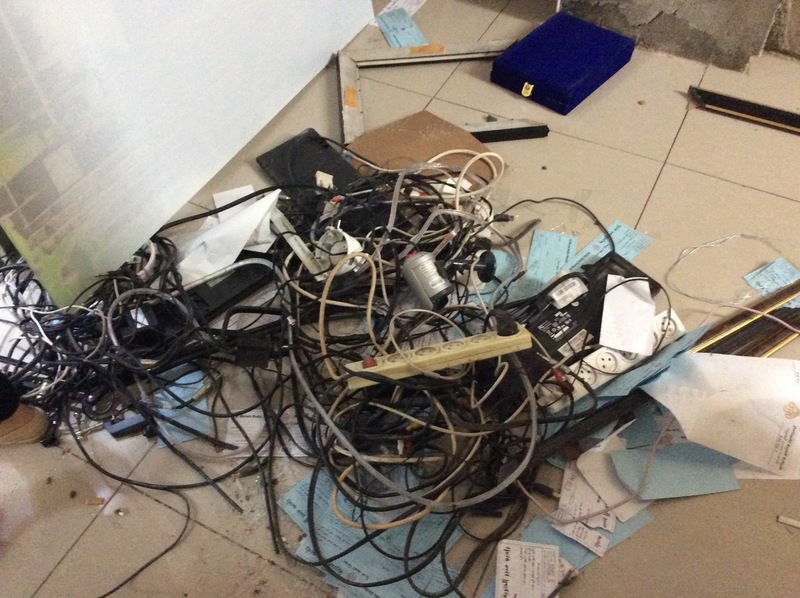 Not only did the IDF close the station, they inflicted serious damage to the office and its equipment. 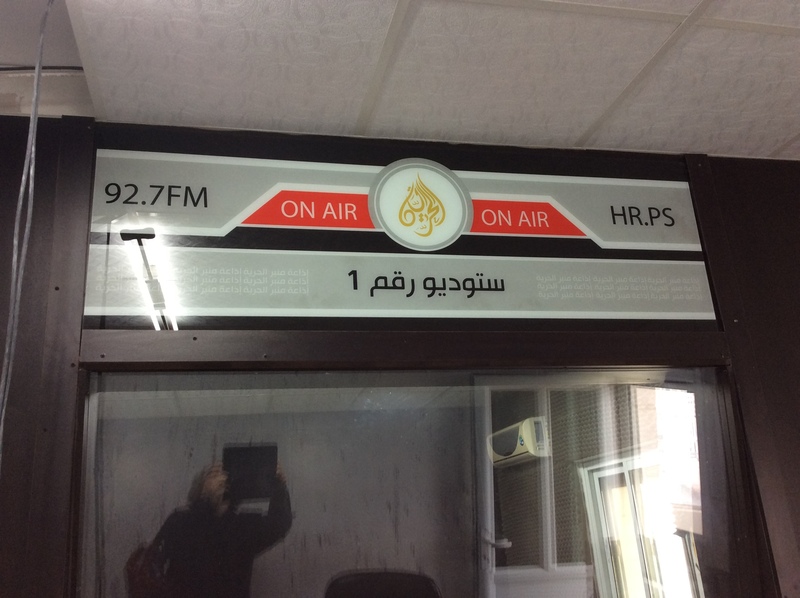 Radio station FM 92.7 HR.PS, now off air as a result of the raid on their offices early Tuesday morning. Freedom of the press is a foundational human right. As the preamble to the UN Declaration of Human Rights so clearly states, “every individual and every organ of society, keeping this Declaration constantly in mind, shall strive… to promote respect for these rights and freedoms and by progressive measures, national and international, to secure their universal and effective recognition and observance, both among the peoples of Member States themselves and among the peoples of territories under their jurisdiction.” Palestinians, as a people under the jurisdiction of Israel (as a result of the illegal Israeli occupation of Palestine) are as deserving of this right as the citizens of the 192 countries that have signed the Declaration. The Bedouin village of Um al Kher lies in the southern portion of the West Bank, nestled in the desert hills of the northern Negev desert. Community members moved there as refugees in the early 1950’s after having been pushed off their land in the Beersheva area of Israel, a few miles south of where they now live. In the 1980’s Israeli settlers arrived and began taking land adjacent to the community to form the Karmel settlement. The land on which the village is located is designated as Area C and is therefore subject to full Israeli control, which has included regular military presence, forced evictions and home demolitions, loss of agricultural lands and harassment by settlers. 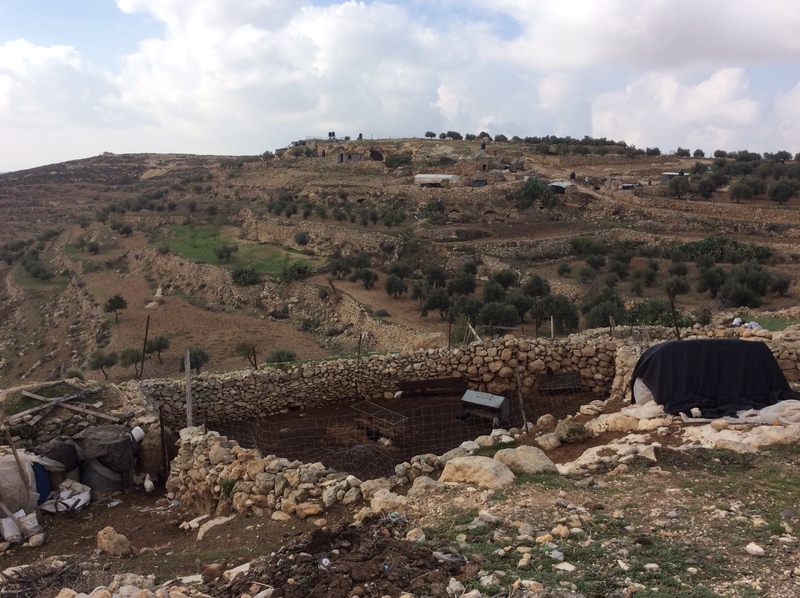 Due in part to its location, Um al Kher is considered by international organizations to be one of the most vulnerable in the southern West Bank. Traditionally a herding community relying on their sheep and goats for income, events of recent years have jeopardized this basic way of life. Poverty and unemployment rates are high. Access to water is limited (and expensive). Villagers are not allowed to hook up to the power grid and rely on small solar panels to provide subsistence electricity. Shepherds endure frequent harassment from the nearby settlers as they graze their sheep, and settlement land confiscation has further limited their access to grazing lands. Dry seasons with lower than average rainfall have produced insufficient plant growth to sustain the sheep. Unable to obtain building permits, the village has endured 4 separate rounds of home demolitions, the last occurring in Oct of 2014 when 6 homes, several outhouses, and the village bread baking oven were demolished. (see postings from Oct, 2014) In spite of these ongoing challenges, the villagers are firm in their resolve to remain on their land. To do so, a better income source is required. In 2013, a generous grant from UNRWA (United Nations Relief and Works Agency for Palestine Refugees) provided funds for a trial thyme growing project. Thyme is the main ingredient in a herb mixture called “za’atar,” a staple in the Palestinian diet. The project proved successful. In the first year of production alone, the cultivation and sale of thyme provided much needed additional income for the community, helping individual farmers and contributing to community projects. 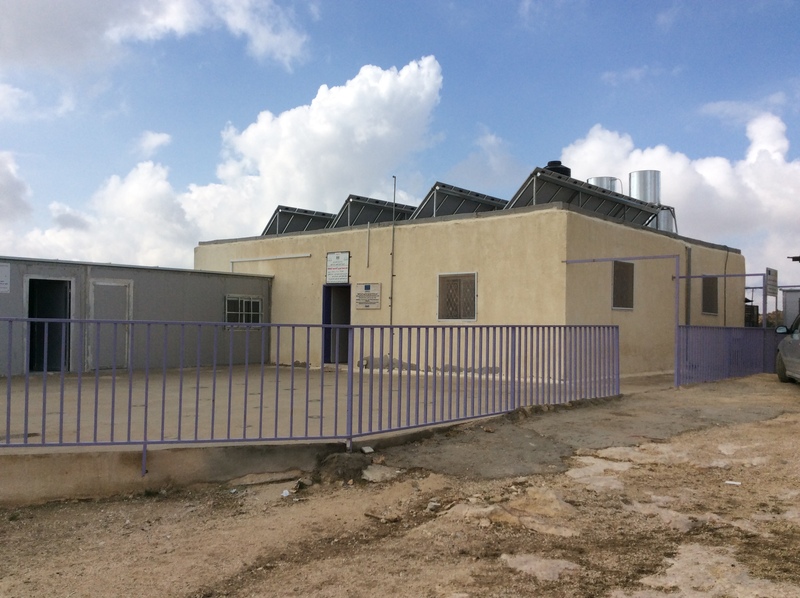 The Um al Kher kindergarten, one of the community projects partially supported by profits from the thyme project. HIRN (Hebron International Resources Network) has become involved in supplying thyme seedlings to the community to extend the project beyond the trial phase. The project is ongoing, with additional plantings happening as HIRN funds allow. On Thursday, we delivered plants to the village and coordinated a planting. 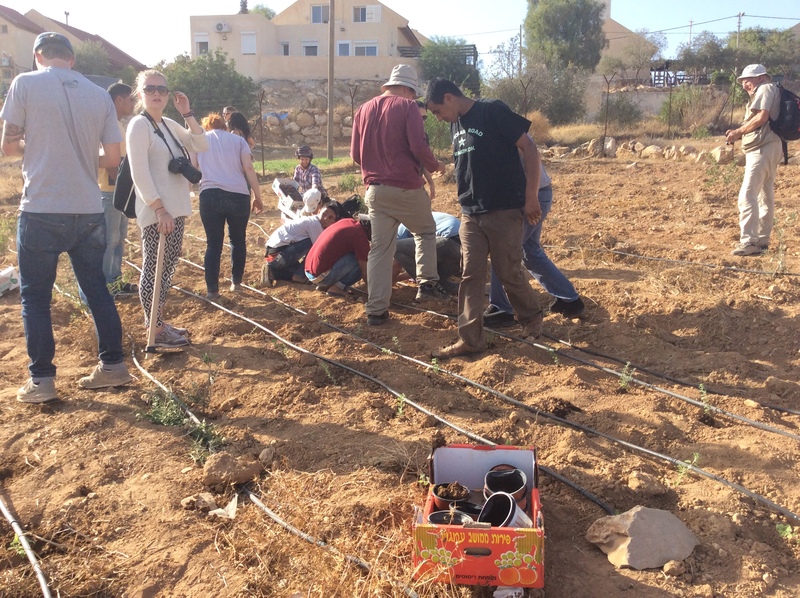 We were joined there by volunteers from EAPPI, visiting British and Swiss volunteers, local Israeli’s from the Villager’s Group, Palestinian villagers, and international members of the Center for Jewish Nonviolence. Together, we planted the thyme seedlings. Local and international, Christian, Jewish and Muslim volunteers working together to plant the thyme. In a time when there is so much violence in the West Bank, it was a bright beacon of light to bring locals and internationals, Muslims, Christians and Jews to work together on a project that offers such hope to a struggling community. 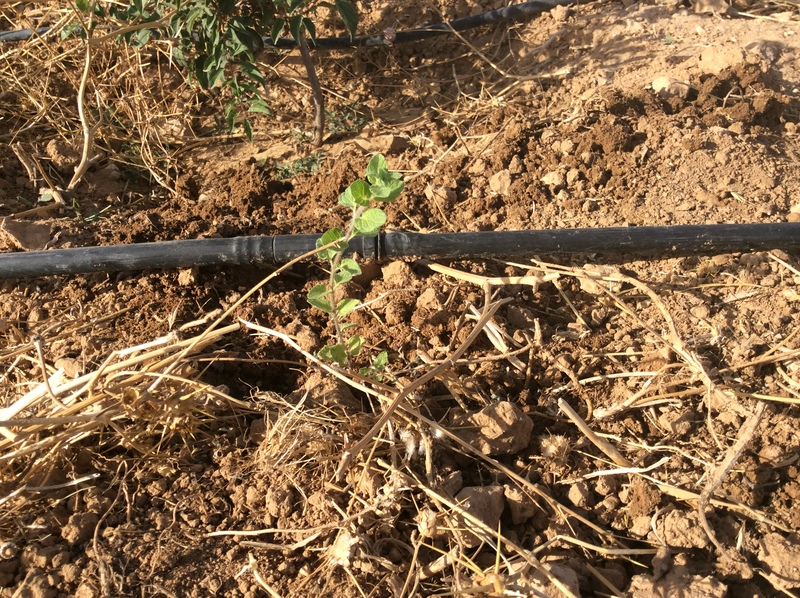 One of the thyme seedlings and the water drip irrigation pipe that is also part of the project. Things are tense these days in all of Palestine. The 48 year Israeli occupation (illegal according to International Humanitarian Law) of Palestine, with even greater repression of human rights over the last several months, has led some young Palestinians to respond violently. Frustrated and desperate, and prohibited from carrying guns, they have resorted to the use of knives as a tool to stab Israeli soldiers and citizens. Israel has responded with what they call “increased security measures,” meaning a further clamp down on Palestinian human rights, a dramatic increase in checkpoints, and what appears to be a “shoot to kill” policy, all of which have served to heighten tensions further. As well, there have been witnessed reports of unarmed Palestinians shot by Israeli soldiers, with a knife later being placed beside the body and the official Israeli report indicating that the individual had attempted to stab an Israeli soldier. The UN OCHA Protection of Civilians Weekly Report for the week of October 13-15, 2015 indicates there were 16 Palestinian and 3 Israeli fatalities, and 1970 Palestinian and 19 Israeli injuries during that time period. In addition, they report that on the following 2 days (Oct 20, 21), there were 9 Palestinian deaths,and 2 Israeli deaths in a total of 10 separate incidents. The escalating violence is a concern for all. UN Secretary General Ban Ki-moon visited Israel and the occupied Palestinian territory on Oct 20 and 21, and issued the following statement: “My visit reflects the sense of global alarm at the dangerous escalation in violence between Israelis and Palestinians. I am here to encourage and support all efforts to lower tensions and prevent the situation from spinning out of control.” He added that “no society should have to live in fear. No society can afford to see its youth suffer in hopelessness”. 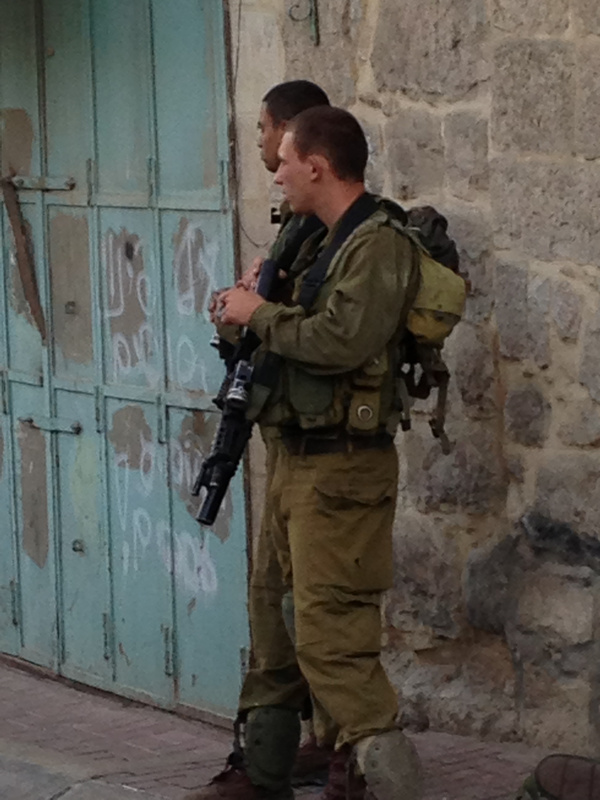 Here in Hebron, things are particularly tense. Hebron is divided into 2 distinct areas. H1 (18 sq km) is home to the majority of the population and is under full Palestinian control. H2 (4.3 sq km) includes the Old City of Hebron and is home to 35,000 Palestinians and 800 Israeli settlers (illegal according to International Humanitarian Law) who live in 4 settlements. Israel has full control of the H2 area. (see Oct 17, 2014 posting “Transforming with Colour, Brightness and Joy,” for more information on Hebron) Many of the Israeli settlers have a history of violence towards their Palestinian neighbours, and many are heavily armed. In recent weeks, they have become more heavily armed. Even though International Humanitarian Law requires the occupying party to provide protection for the occupied people, the reality is that there are several hundred Israeli soldiers in H2 whose sole role is to protect the Israeli settlers. It is the H2 area where most of the oppression, poverty and tensions are present, and it is the H2 area and the area immediately outside of it that is where the violence is occurring. 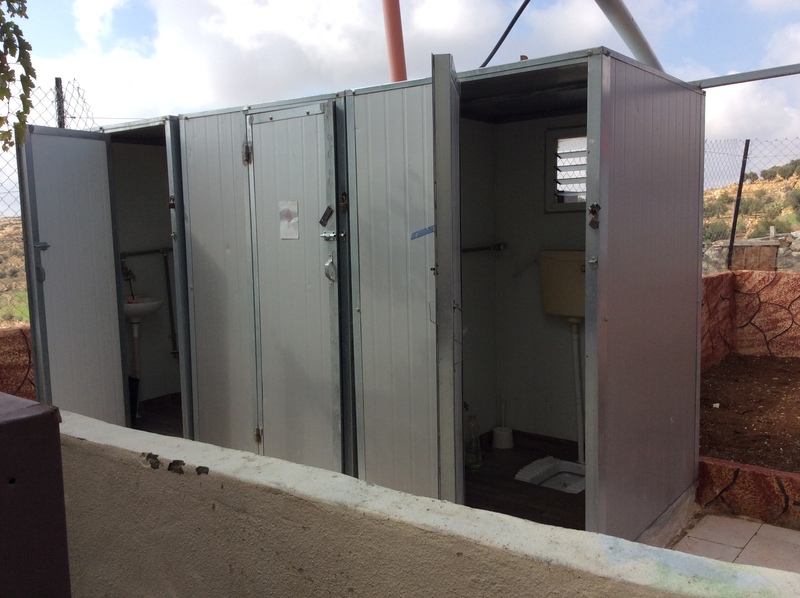 Here are two stories that were reported to us this past week: On Tuesday, 2 teenage boys aged 15 and 17 passed through one of the many Israeli checkpoints in H2. They passed through a metal detector and were body searched for knives. Finding none, the soldiers allowed them to pass through. Shortly after leaving the checkpoint, the boys encountered a group of settlers coming towards them. Fearful of the settlers, they turned back towards the checkpoint they had just passed through and were shot by the soldiers. Both boys died. Later in the week, a highly respected Palestinian peace activist Dr Hashem al Azzeh died after being overcome by tear gas. Dr Azzeh and his family lived in the Tel Rumeida neighbourhood of H2. Despite enduring years of harassment by settlers, he has been a model of non violent peaceful resistance. He leaves behind his wife and young family, the oldest of whom is 13. We attended his funeral yesterday. 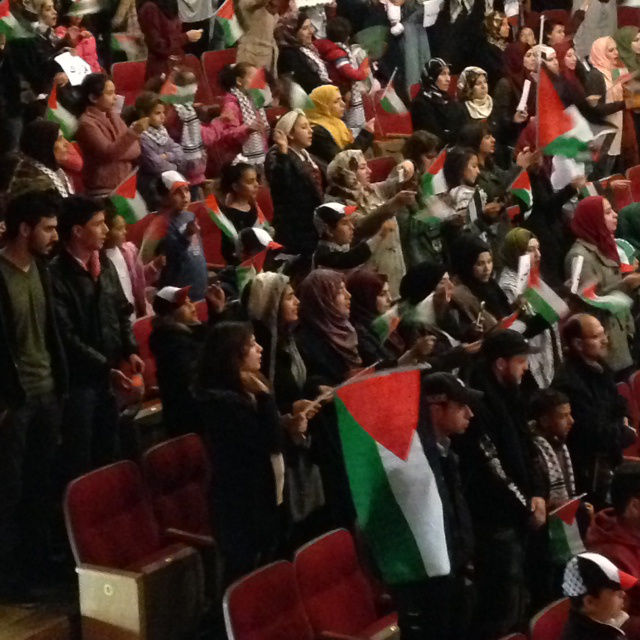 Part of the assembled crowd at Palestinian non violent peace activist Dr Hashem al Azzeh’s funeral. Here at HIRN, we are doing what we can to help. A number of Palestinian families in the H2 area are subject to settler violence, including the use of molotov cocktails thrown at their homes. They are also subject to bullets from both the army and the armed settlers, and tear gas that the army uses in most clashes as it drifts into their neighbourhoods. Yesterday, we provided 10 fire extinguishers to the Hebron Rehabilitation Committee to be distributed to homes in the H2 area that are at risk. 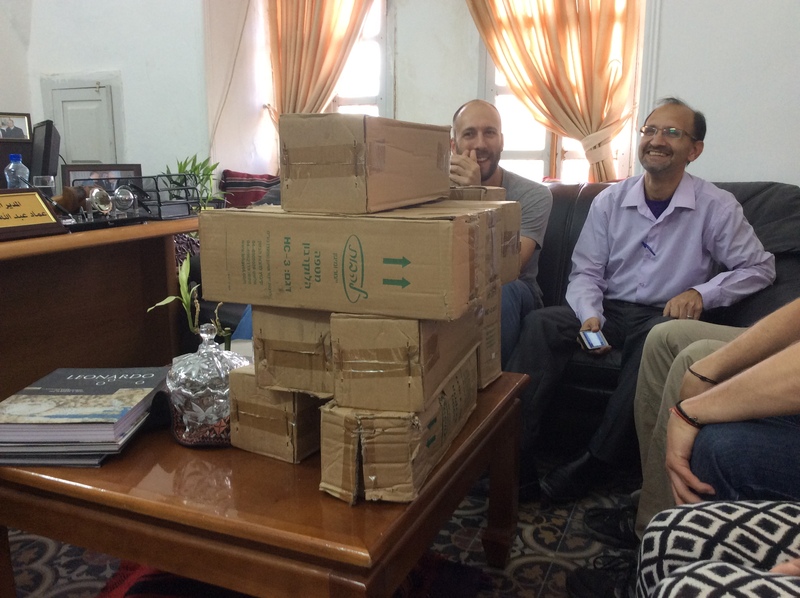 The fire extinguishers that were delivered by HIRN to the Hebron Rehabilitation Committee. 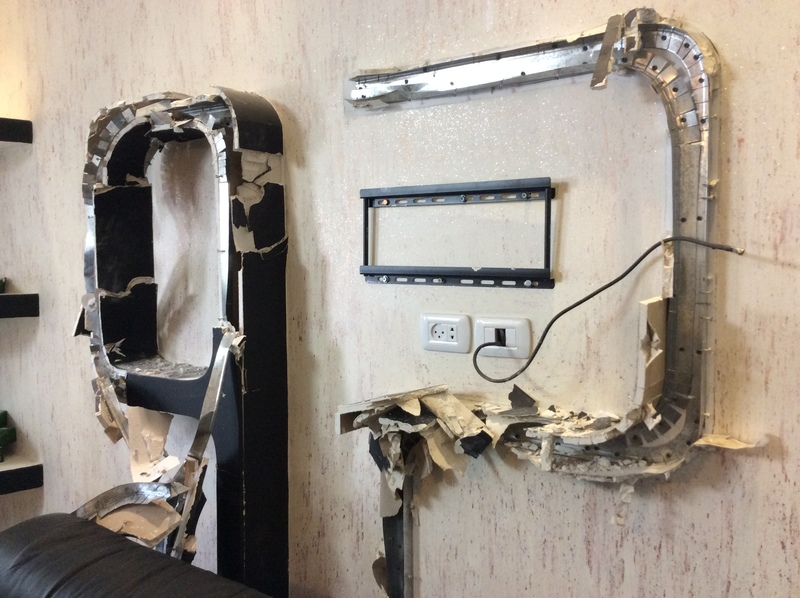 We also are working to connect the Hebron Rehabilitation Committee with an NGO funder who have agreed to help fund the costs of further fire extinguishers, gas masks and bulletproof glass for the homes of those at greatest risk. Regardless of your perspective, it is a well known truth that violence begets violence. In a troubled land where violence and the power of the gun has ruled for far too long, Peace is long awaited and prayed for.